The Art Deco love child of Citroën and Maserati is long gone, dead and buried like its contemporary the Concorde. But have we really lost the need for a grand tourer with speed and style in spades? Infrequent bursts of fawning published in these pages will prove that the Citroën SM, in its quiet yet revolutionary way, is perhaps the most remarkable automobile ever manufactured. Yet owning one is clearly out of the picture. Consider: if the engine goes, you’ll have to find a mechanic familiar with 40-year-old carbureted Maserati engines. Then, if anything else goes, you’ll need another mechanic intimate with 40-year-old hydropneumatic Citroëns. If you multiply the respective probabilities of finding such mechanics, you will feel the blood drain from your face. The nightmarish nature of this scenario is not specific to the United States: contrary to popular belief, Europe does not have trees with mixed bunches of Maserati and Citroën mechanics cavorting on low-hanging branches either. Yet the SM exerts a powerful visceral tug. Its parts are remarkable by themselves, but the SM is clear testament to the idea that on occasion the whole is indeeed greater than the sum of parts. The strange yet mellifluous 90° V6, the DIRAVI steering, the hydropneumatics, the incredible cabin: the SM’s components combine to make a car that has the ability to cruise in complete comfort at 125 MPH between fillups without breaking down. Think about that: neither occasional bursts of speed for joy or overtaking nor a single cross-continental blitz with the result of you being on time and your car a smoldering wreck, but a grand tourer for regular grand tours. Yes, wow. That was four decades ago. 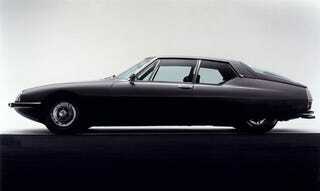 Perhaps we should all just forget about the Citroën SM. Ours is a world not of grand tours but of shuffling in socks through airports and molassing along at 65 MPH in plastic cabins. Yet imagine! Just imagine a contemporary SM. The Japanese would have to build it. The Japanese are less interested in haphazard, grandiose revolution than in taking established concepts and polishing them to perfection. The way Toyota usurped Mercedes-Benz’s lead in luxury sedans to produce the last word in personal transportation inside motorized whales, the Lexus LS600hL. But a modern SM is not a Toyota job. In spite of occasional displays of deep petrolhead inspiration—the 2000GT, the AE86, the LFA—Toyota does not make touring cars you’d like to tour in high style in. The modern SM should be a Honda, built on Soichiro Honda’s legacy of mechanical madness and racing chops. In fact, Honda has already made something akin to a modern SM: the NSX of 1991, a perfect, luxurious grand tourer disguised as a mid-engined sports car and generally mistaken for a Ferrari. Plus, they have taken the SM’s glass headlights enclosure and installed it on the current Civic, which is as close in chutzpah to the SM as a mass-market hatchback can be. Honda could pull it off. As for what our slow world could do with the perfect idea of the touring car executed with Japenese attention to detail, I do not have a clue. But do we really want to go down in history as the generation which has all but abandoned forward motion?